On June 24, 2001, at Emerich Field, Camano Island, WA, I entered my first oval course race. This race was put on by W.R.A.G. and was approved by NOTRA (National Oval Track Racing Assoc.). I had gone over to Jo's a couple of days last week to practice with the boxes. Instead of being hand slipped, we are put in starting boxes, just like race horses! 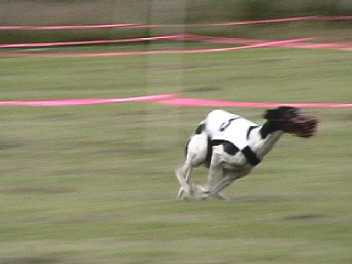 My first race was with three other dogs. Since this was my first time entered, I ran with the slower dogs. I started out really good. I broke out of the box great and was in the lead until we came to the curve. If I had stayed in tighter, I would have done better. I came in third place. That's me coming around the corner, third from left. 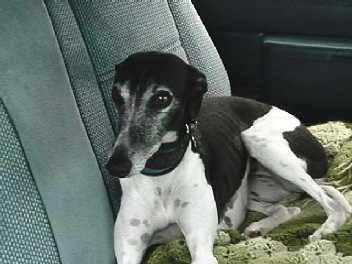 Here's me looking like a real race dog! 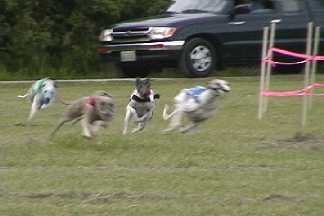 My second race was also with three other dogs. This time, I came in second. But, unfortunately, somewhere during the race, I hurt my toe! Mom put ice on it and babied me more than usual. I didn't get to run the remaining two races. I came in 15th out of 18 dogs, even though I only ran 2 of 4 races! Just wait!